Did you know that nearly a month ago I attended Aussie Indie Con. I'm so sorry that I never got around to doing a wrap up post about it because it was a fantastic day and I met so many Aussie indie enthusiasts. Sadly I was too busy having fun that I didn't take any photos. One of the girls I met was Tracy from Olivia Jade Nails. We didn't take a selfie photo, but we did take a nails photo. Only problem was that it was at the end of the day and I had been doing water marbling demos and workshops, so my nails were a random mess of various colour combos in various water marble patterns. Another person I met was Margaret from @loveslacquer who was travelling with Tracy. The reason I mention both those ladies is because Tracy is part of the Digital Dozen of course, and Margaret inspired these nails. At Aussie indie con I talked about the fact that I hadn't done a circular marble as I had never got them to work nicely. Margaret showed me a red, black and white circular marble she had done back in May last year and it inspired me. It's so weird attending nail meet ups like that, because you generally don't recognise anyone's face. But someone had pointed out to me who Tracy and Margaret were, quietly sitting at the side of the room. I wandered over to them and said their names and they were both looking at me like 'yeah, and who are you, we have no idea and it's freaking us our that you know who we are'. Then I said 'I'm Cathy'. Then they both jumped up and we all hugged and we started chatting like we were besties. 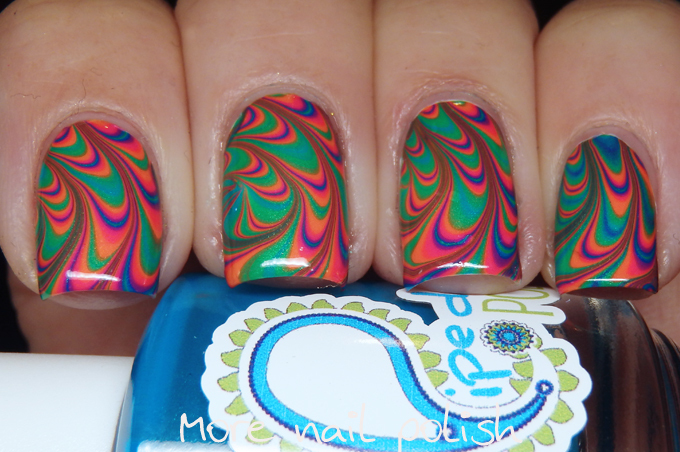 Today's water marble uses one of my favourite brands for water marbling, US based Pipedream polish. Which covers off North America in our trip around the world via 5 continents. I used all five polishes from the Street Carnival collection that I managed to pick up in a blog sale last year. On my right hand I had most of the marbles centered on my nail, except one where I didn't line it up as well and ended up with the side of the marble and not the centre. I actually loved that one the most and decided to do that on my left hand. Let me reiterate that, because so many people at my demos and workshop at Aussie indie Con asked me. Yes, I do in fact marble both my hands. LOL! wowwwww!!!!!!!!!!!!!! 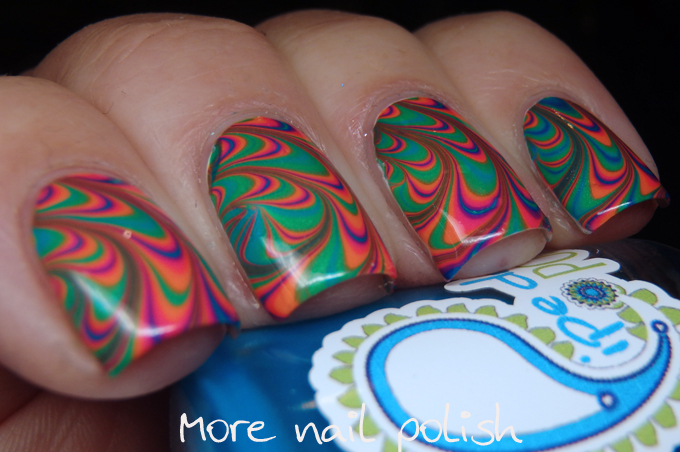 stunning water marble. you girls meet there, how lucky you are. pipe dream is now just a dream for me coz she discontinued NEONcollection. Whoa! These are insane! So pretty and just amazing! I bet that would be fun and quite awkward all at once! Watermarbling perfection right here ❤️❤️❤️ I'm still in awe that you can watermarble on both hands! That is an extremely impressive skill. Oh lawdy! This is absolutely amazing! They look so perfect they also look like decals! Dang, these are incredible!! They look perfect!